THIRD TIME MARRIED OLINDA, SAYS “@tytantheone we will get through this. It’s not the end of the world. Everyone flirts . . . hell I was flirting with the KFC guy just to get a little extra chicken and free dips. 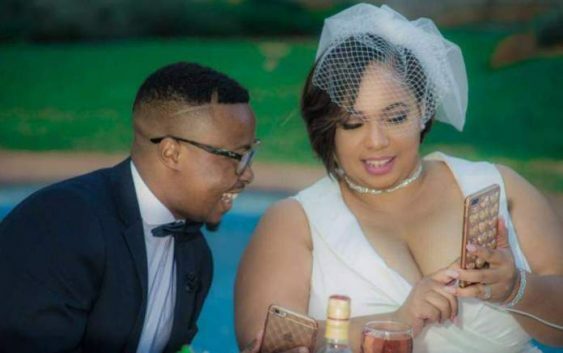 Wedded “Zim celebrity couple” Olinda and Tytan are fighting to stay together following a flirting scandal by the later that gripped social media over the weekend. Olinda, 35, who is now on her third marriage, took to her pages to state that she had forgiven Tytan and is not going to let this one go easily. This followed revelation by Tallyn Ndudzo known as Tadzo TN TN that the 28-year-old musician has been flirting and supposedly pursuing a sexual relationship with her, posting pictures of her conversations with Tytan online. Tytan then took time to clear his name and apologise for being explicit while in talks with a woman who was not his wife. He also apologised and even went on Facebook for a live broadcast explaining that there was nothing between him and Tallyn and felt like it was a trap. After a nasty break up with another musician (Stunner) last year, after she was cheated on, Olinda said this time she was going to stay and fight for her relationship, even taking a picture of her marriage certificate in the drawers to prove that they were still safe. “@tytantheone we will get through this. It’s not the end of the world. Everyone flirts . . . hell I was flirting with the KFC guy just to get a little extra chicken and free dips. “Unfortunately you flirted with someone that was recording you and keeping a file and you fell for it wanzwa butter and I hope you have learnt your lesson the hard way,” she wrote. She said we were going to use the experience to grow her brand. “Rising above the tide. Don’t get mad when I start building using the bricks you throw at me. All I ask is make sure you throw the roofing tiles too #olindachapelfoundation #olindachapellive #olindachapel #happymonday #youdonthavepoweroverme #queen #ceo #bosslady #reign #crown #mythronemyrule,” Olinda wrote. Tytan paid lobola for Olinda in the United Kingdom early this year. She revealed in one interview that she was once married for 10 years, she has two kids, had her first child in 2001 when she was still 17. Olinda was involved in a nasty break up with Stunner, after accusing the rap artiste of extra-marital affairs. She cried on live Facebook posts, drawing sympathy from several people, ending his blissful marriage with the controversial rapper. Followed by 11,571 people – By Sibusiso Ngwenya.